1886 signifies the time when the team became commonly referred to as the Saints. The club's greatest rival in the period was the neighbouring Prahran club. Though news of an amalgamation between the two clubs was consistently bandied about the players of the respective clubs maintained an unhealthy dislike of each other and waged some of the most ferocious and brutal contests seen in years. The persistent rumours of an amalgamation were fully realised in the lead-up to the 1888 season. The club members charged with the responsibility of brokering the deal with Prahran had done a great service for the St.Kilda club. Both the St.Kilda name and colours would be retained and home games were to be played on the St.Kilda Cricket Ground. The only visible concession was that the players would now wear blue knickerbockers in line with the Prahran uniform, rather than St.Kilda's customary white. The St.Kilda list improved significantly as a result of the merger. It now included Morehouse, Lockett and Little, while experienced Prahran men, Dunn and Collie, were named captain and vice-captain respectively. The first match of the 1888 season was a baptism of fire for the new football identity. St.Kilda had drawn the premiers from the previous year, Carlton, for the season opener. The new-look Saints impressed everyone at the ground with their determined play in the first half and matched it with their more fancied opposition. The experienced Blues were able to steady after the long break and began to slowly gain the advantage over the dogged Saints. At the close of play, the scoreboard showed St.Kilda down by three goals, but the players had won over their growing supporter base with the gritty performance they had shown in defeat. Round two offered no respite. 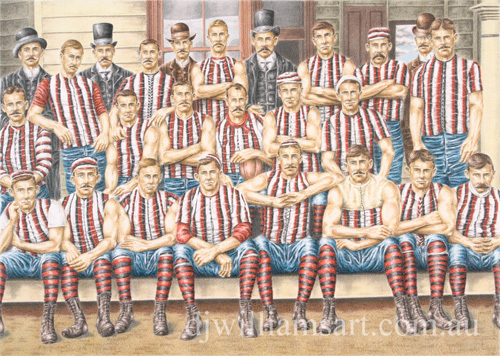 St.Kilda would face Geelong, who had finished the 1887 season as runner-up to Carlton. Once again, the Saints held their own for much of the afternoon against seasoned opposition. As the second half progressed, the St.Kilda players showed no sign of easing up and it appeared that an upset was in the making. The Saints pushed Geelong all the way to the final bell, but fell just shy of victory by one goal. The St.Kilda players won many admirers with their efforts throughout the season and gave their supporters much to cheer about. While eight wins and three draws might not have been overly impressive, there was enough improvement in the team for it to be deemed a satisfying season. It was not simply the final standings that had pleased the club's supporters; the performances of a number of players had made the season one to remember. The goal-kicking of O'Connor was a major highlight. The star forward was a beacon of light for the team and finished the year with 23 of the club's 87 goals to his credit. Others who performed credibly for the new look Saints in 1888 were Carbine Simpson, Alf Smith, Jim Moorhouse, Henry McCoy and young Fred McDonald. St.Kilda looked in good shape for the seasons ahead.